RadRichTextBox exposes a full set of commands that provide an alternative to its API methods, exposed through its Commands property. For each of the Formatting API methods there is a respective command. In order to use the command with a UI Element that supports commanding, you have to bind the Command property of the element to the respective command of the RadRichTextBox. 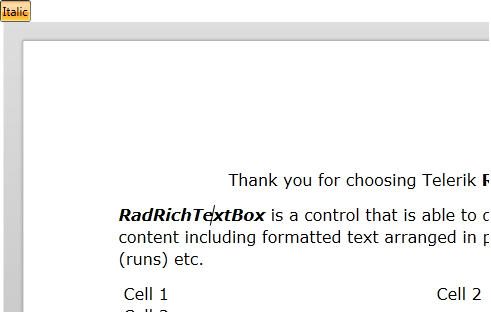 To see a list of all the commands exposed by RadRichTextBox, visit this topic. Here is an example with a RadToggleButtonControl. Now when the button is clicked, it will toggle the boldness of the current selection. The thing it won't do is to respond to the current state of the selection. For example, if the context of the caret is a bold text, the button in the UI won't get automatically toggled. In order to implement this behavior, you have to handle the ToggleStateChanged event of the ToggleBoldCommand following an approach similar to the one shown in Example 2. Now the button will respond to the current state of the selection. You can also use the functionality provided by the RadRichTextBoxRibbonUI class in order to get the event handling out of the box. 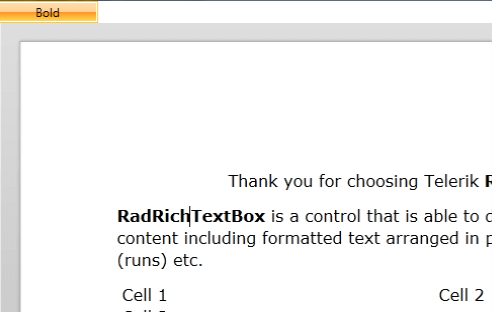 The RadRichTextBoxRibbonUI provides you with a fully predefined UI for RadRichTextBox. To learn how to use it read this topic. If you are building your UI manually, for example using a RadRibbonView control, you have to only bind the command to the RadRichTextBoxRibbonUI.RichTextCommand attached property of the desired RadRibbonView control. Here is an example with a RadRibbonToggleButton. The RadRibbonToggleButton will get automatically toggled whenever the context of the caret is an italic text. More about the specific buttons introduced with RadRibbonView you can find here. You can remove some of the bindings by using RadRichTextBox.RegisteredApplicationCommands collection. RadRichTextBox exposes two events that allow you interfere the process of executing a command. You can find a runnable example demonstrating how to use the CommandExecuting and CommandExecuted events to customize the behavior of a command in our SDK repository on GitHub. The CommandExecuting event fires just before the execution of a command. You can use it to stop the command or modify its behavior/parameter. The parameters the event enables you to use are of type CommandExecutingEventArgs and can give you information about the command the event is fired for and its parameter. An example usage of this event is when you need to modify the content that is pasted into the document. In this case, you can easily obtain the content in the clipboard and change it according to your needs just before executing the PasteCommand. You can combine the code from Examples 8 and 9 so you can stop the default execution of a command and perform your own logic. The CommandExecuted event fires after the execution of a command. You can use it to stop the command or modify its behavior/parameter. The parameters the event enables you to use are of type CommandExecutedEventArgs and can give you information about the command the event is fired for. It is useful when you need to add an additional logic that should be executed after a particular command. Example 10 demonstrates how you can modify each image after its insertion into the document to ensure it is not wider than the maximum width defined. // After inserting an image, ensure that its width is not more than 200px. 'After inserting an image, ensure that its width Is Not more than 200px. This event fires when a command fails to execute its operation. It is useful to handle issues that might occur and collect more information about them. The parameters of this event give you information about the error and enable you to set it as handled.